When you arrive in Stonyford, turn left at the stop sign. It is about 20 minutes on this road to the LZ. The road will wind up over the hills, then descend down to a valley. When you reach the valley continue and look on the right for the Fouts Spring Youth Facility. To go to Dixie Glade Camp and launch from the LZ continue on the same road up the mountain. Turn left and follow this until it makes a 90 degree right turn and becomes steep. There is a trail-head and room to park at this elbow. 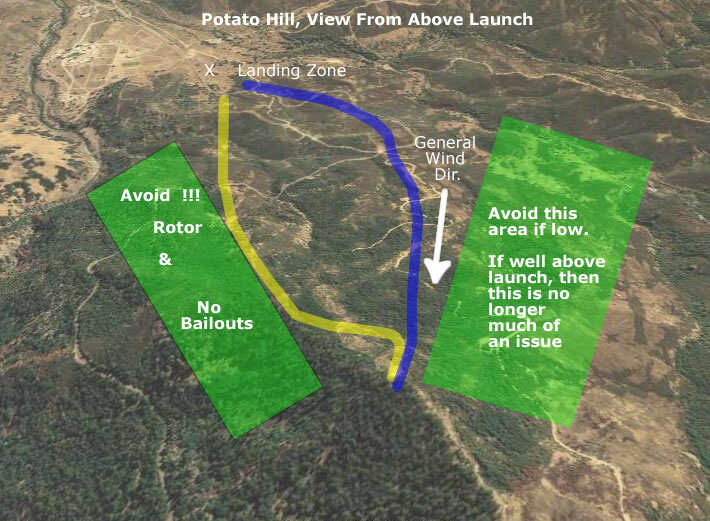 The Trail at this elbow goes to the Potato Launch. The hike is about 10 – 15 minutes and has not intersections, just stay on the trail. Below are some photos of Potato Hill. The Yellow and Blue paths are the two most common flight paths used at this site. Most of the time, I prefer to use the yellow path, but either can work. 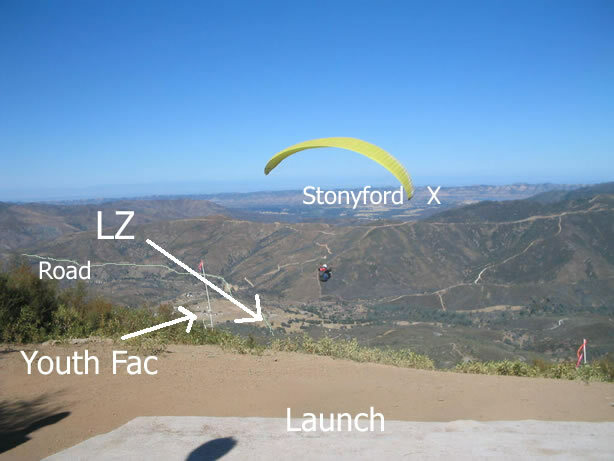 Both primary paths target higher terrain where lift will be better and increase the chances of reaching the LZ with extra altitude. The spine of the left is very easy to see from launch and any thermals that rise up the slope below the top of the ridge will release above the spine. On flights where lift and thermals are encountered, a pilot can climb and have a little freedom from continuing towards the LZ. But, whenever a pilot starts to lose lift and begins descending again, the flight plan dictates to stay on the flight path. Once well up in a thermal, moving around a bit above the general area is fine. Once a pilot moves back down toward launch level, moving back to the primary path comes back into play.. I normally find better lift on the yellow path, but either can work good for flight. 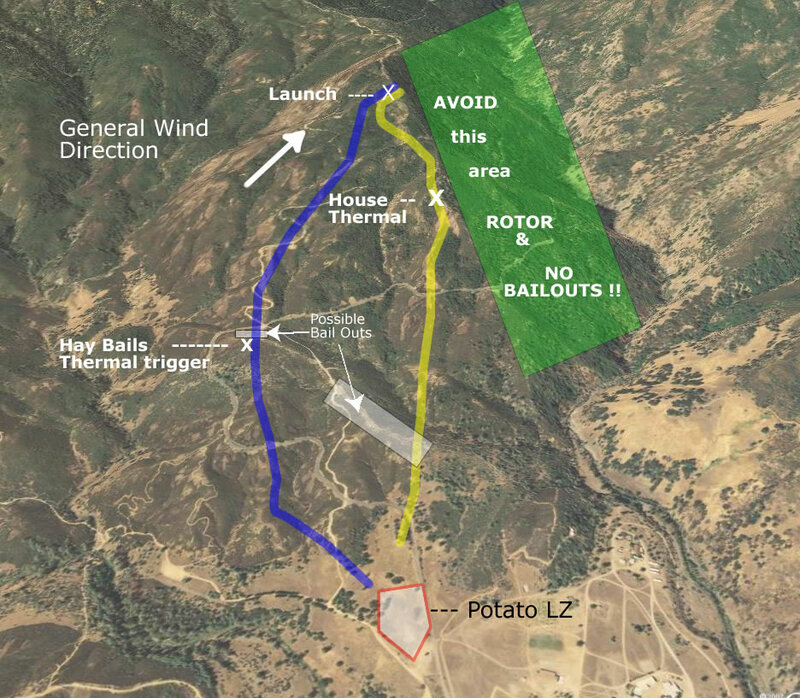 Many think the Hay Bails is the best thermal, but the most consistent thermal at Potato is the one on the ridge to the left of launch. Also, this path usually provided easier ability to reach the LZ with some extra height. which used to be a detention center and is now closed.